Some bands have success early on and then reach a newfound level of success years down the road. 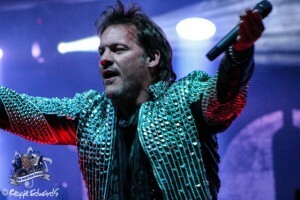 This is the case with Fozzy- who found some early success and attention with WWE Superstar Chris Jericho as frontman. 2017 has seen the band catapult to even higher levels with the release of their latest single- “Judas,” which reached no. 1 on the charts and over 1 million views online in just a few weeks. The band has recently hit the road for their first headline tour in years- appropriately tagged as “Judas Rising,” which has seen them hit most of the major festivals and a few markets they haven’t played in awhile. The tour recently hit Louisville’s premiere rock venue- Trixie’s Entertainment Center- for a night that won’t soon be forgotten. After blistering sets from Sons of Texas and Kyng- both of which proved why they’re two of the most promising up and coming bands in all of metal- the almighty Fozzy took the stage. As the lights went down and the opening tones of “Judas” began, the near-capacity crowd went insane and completely lost it when the band entered the stage. The crowd was deafening during opening song “Judas” and were so much so that you couldn’t hear the band sing during the chorus, which Chris Jericho fed off of and gave every bit of back to the crowd. Having only been off the road with WWE for a few days at the time of the show, you’d expect him to be tired or burned out but, if he was, he didn’t show it. 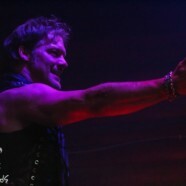 Jericho commanded every inch of the stage and demanded every ounce of energy from the crowd. Then there’s guitarist Rich Ward- “The Duke”- who never stops dancing and strutting around the stage. When the band is having fun, it makes it even more fun for the crowd and that’s what Louisville’s show was- pure fun. With a headlining set, there was time for a lot more Fozzy songs and they packed 18 songs into the set, including “Eat The Rich,” a cover of Judas Priest’s “Freewheel Burning,” “Inside My Head” which hadn’t been played live in years- if ever- and more. When it was all said and done, Fozzy showed everyone why they’re one of the greatest bands in the world to see live. After 17 years, they’re still having fun onstage and that spreads to the crowd. It’s an infectious energy that makes you want to keep coming back.